Fast tat as always, less than a week. TLDR:skip the wall of text and scroll down for eye candy! White Raspberry Soap (two bars, one still in tissue) - Tart raspberry and a clean cream accord. 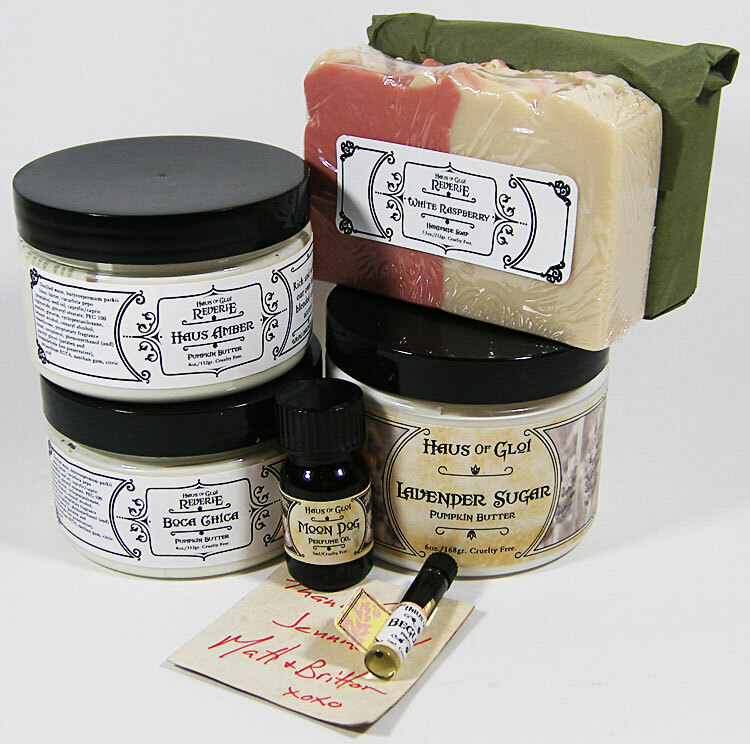 --I really love this soap's scent and I know I love HoG's soap, win win! Haus Amber Pumpkin Butter - Rich and sultry amber, our own hand blended accord. Boca Chica Pumpkin Butter - Rich gardenia blossom, red mandarin, coconut cream and ripe banana. This sounds super fruity, but it is surprisingly not so! --Definitely Gardenia! I think the fruit scents enhance the power of the Gardenia, a very nice compliment to it. This is a floral that I wear despite my chemistry amping it like woah. I love Gardenia, because it reminds me of many things special to me. When I was little, Jungle Gardenia perfume was one of the first ones that I wore, and it belonged to my Grandma. Its her favorite/signature scent. Second to that, I have visited Hawaii twice and this scent really takes me back there to that relaxed and beautiful place. Britton has perfectly captured this scent which has brought back many of my precious memories. Lavender Sugar Pumpkin Butter - Gentle Bulgarian lavender and a heaping spoonful of pure cane sugar. --Very yummy smelling, I get caramelized sugar and a soft lavender. I was unsure at jar sniff, but I've worn it now and LOVE it. Moon Dog Perfume Oil - Solar storms erupt: pure cracked coconut, dry sandalwood essence, heated with nutmeg and clove. --I really love this scent! It reminds me somewhat of HoG's Picaroon, but warmer - not quite as bright. Its comforting and warm, but I think it'd be perfect for summer time too, quite a flexible scent! Beguiled perfume oil sample freebie - Lemon cake made with the tang of fresh buttermilk and raspberry coulis - an otherwise innocent cake corrupted by cardamon and deceptive pink peppercorns. These products were bought with my own money and my review was not influenced by anyone or anything other than the products and my own experience.